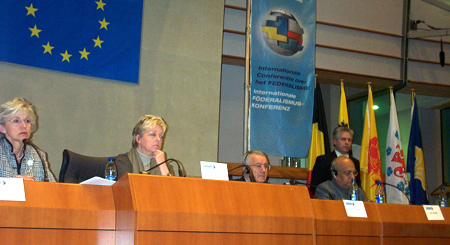 In March 2005, the federal and federated governments of Belgium hosted the Third International Conference on Federalism. In a number of ways, the Brussels conference is an important turning point, and presents an opportunity to reflect not just on the conference itself but also the ongoing international dialogue on federalism of which the conferences are an integral part. With the success of the Brussels conference, and the confirmation of the Fourth Conference in Delhi for 2007, the continuity of the International Conference on Federalism on a triennial basis has been established. While each conference is unique, each also makes an important contribution to what is now an ongoing process. Looking back, the 1999 conference in Mont-Tremblant offered a chance for practitioners and scholars to look broadly at the role of federalism in a globalizing world. The level of participation from around the world, including many from the highest levels of government, demonstrated the high degree of interest in these issues. The conference in Brussels brought together over 1,000 participants from over 80 countries, making it the largest conference to date. Harnessing and building on this interest, the St. Gallen conference took a methodical approach to continue the dialogue. It is in this context which the Brussels conference must be considered. Held to coincide with the 25th anniversary of Belgian federalism, the event came at a time of significant political change internationally. The peace process in Sudan, nation-building efforts in Afghanistan and Iraq, the development of a European constitution: all had an important impact on the discussions in Brussels. In many ways, then, the third conference took the more thematic focus of previous conferences and applied it to topical issues around the world. In addition to ensuring a continued high level of interest, the event also showed the growing importance of federal approaches in managing social, political and economic change. With a hugely diverse list of speakers and participants, a wide range of cases and experiences was obviously covered over the course of the three days. The role of the general rapporteurs, however, served to identify common elements across each of the four themes. As a result, the conference proceedings offer two separate perspectives on the discussions. On the one hand, the plenary speakers provided a range of views on the relevance of federal ideas to a particular country or region. The presentations in these sessions represented a cross-section of traditional federal states, emerging federations, and even unitary states: of the 14 countries represented in the plenary sessions, seven were from non-federal states. In comparison to previous conferences, this diversity in speakers clearly showed the growing interest in the possibilities of federal governance beyond the established federations of the world. The importance of these ideas to the most topical processes of political change around the world was made clear by the prominent interventions of representatives from Sudan and the Philippines, for instance. The working groups, on the other hand, were able both to address particular case studies, as well as draw out common elements across a particular theme. The roles of the theme coordinator, vice-chairs, and general rapporteurs, both before and after the working group sessions, were particularly helpful in identifying trends from the broad range of case studies. The conference was broadly divided into plenary and working group sessions, with the latter organized along the following broad themes. (1) The Foundations of Federalism, (2) Federalism and the Distribution of Responsibilities, (3) Federal Techniques and Methods of Functioning, (4) Federalism and International Relations. The following attempts to highlight some of the main points of discussion, based largely on the work of the general rapporteurs, over the course of the conference. The discussions under this thematic heading focused on federalism and democratic legitimacy; socio-cultural identity and asymmetric federalism; and the role of federalism in conflict prevention. With respect to the first subtheme, the discussions highlighted the ambivalent relationship between a federal structure and democratic legitimacy. While federalism has enormous potential to enhance the democratic process, a federal system of government on its own would not guarantee this outcome. On the one hand, the application of the subsidiarity principle can increase democratic participation by bringing political decision-making closer to the individual. A robust system of multi-level government can also create further checks and balances within government. On the other hand, federalism carries with it certain risks. The discussions pointed to the possibility of enhanced regional cleavages, as well as the impact of complex institutional arrangements on efficiency, transparency and responsibility within government. Discussions on asymmetry and conflict prevention also highlighted the potential for federalism to play a positive role in accommodating diversity and mitigating conflict. As with democratic legitimacy, however, federalism’s positive contribution in this area depends on the wider governance context, and most importantly on a constructive dialogue among actors. At an institutional level, this dialogue must be represented by an active and constructive participation of constituent units at the national level. Overall, the discussions around the first theme focused on the potential of federal principles as a powerful tool; the realisation of that potential depends on the disposition of those in power. The theme of federalism as a tool, rather than the solution to a problem, reoccurs throughout the working groups. Subthemes examined here were federalism and the protection of fundamental rights, the division of powers in education and cultural affairs, and questions of public finance. Given the strong correlations, it is not surprising that discussions on the protection of rights focused on the same federal ambivalence as the parallel debate on democratic legitimacy. By extension, those aspects of federalism which can contribute to enhanced democratic legitimacy – increased political participation, further checks and guarantees against abuses of power – can also contribute to improved protection of rights. The substance and expression of those rights, however, raises the possibility of conflict between federalism and the principles of liberal democracy. If rights take the form of group rights, for instance in the case of minorities, then these must be reconciled with the rights of the individual. This theoretical tension becomes more tangible when minorities or other groups are represented, and their group rights protected, through federal structures. Education and media policy in federations, particularly those designed to protect cultural diversity, often highlights this tension. Those examining this theme pointed out, however, that larger forces of economic and technological change are forcing a deeper cooperation in these policy areas. Discussions on public finances also highlighted the need to balance autonomy with cooperation on expenditures to ensure stability and economic growth. In both of these areas, therefore, federal governance plays an important role in reconciling inner diversity and autonomy with the need for coordination in quickly evolving policy areas. This emphasis on effectively managing change, whether political, economic or social, can be seen across the various themes. The working groups in this theme looked at a set of three institutions which are central to effective federal governance: constitutional courts, the participation of states in the federal government, and different forms of intergovernmental agreements. Constitutional courts were discussed as a key feature of federal states. As the arbitrator in resolving constitutional disputes, the courts play a crucial role in guaranteeing the integrity of the federal structure. To perform this role, the group concluded, the courts must have a high degree of legitimacy, often lacking in new or emerging federations. Establishing and maintaining this legitimacy, however, fell not just to the courts themselves, but to political leaders and the people. The question of legitimacy and its basis is closely linked to how well the rule-of-law is established, once again highlighting the importance of underlying attitudes and political culture. Ultimately, federal governance is a function of both the federal and constituent levels. The question, then, of how they interact is central to the federal process. Here the discussions logically began with the role of second legislative chambers in federations, often the most common instrument for ensuring constituent-level input at the federal level. Despite its frequency, however, the difficulty in establishing effective bicameral legislatures has led to the expansion cooperative policy-making at the executive level. These mechanisms vary greatly in form and function, depending on a range of factors including the form of government and the role of political parties. The third working group looked specifically at intergovernmental agreements that arise from this interaction. Across the range of experiences, there was a common recognition that federal governance must be seen as a process, rather than a static structure. The propensity for these processes to take place outside of a legislative environment, however, requires an effort to make them as transparent as possible. The analysis of federalism in its international context has progressed dramatically since the topic was addressed at the Mont-Tremblant conference. Traditionally, international relations have been the domain of national governments: within the state, it is generally a reserved federal power; international bodies, moreover, tend to ignore the constitutional composition of member states. Federal principles have been propelled into international relations at two different levels. First, regionalization has to varying degrees created another level of governance at a supranational level. While the European Union represents the most developed example of this phenomenon, less dramatic but similar processes are underway on most continents. Deepening cooperation at the regional level brings with it an institutionalization of relations among members. The elements of federal governance that emerge from this process were the focus of many of the discussions under this theme. The other component to this theme related to the greater role for constituent units in developing foreign policy and participating in international relations. The growing number of areas, especially in areas of subnational competence, in which international commitments and cooperation have an impact, has eroded the traditional jurisdictional divisions between federal and constituent-unit levels. While federal states have responded to these changing in a variety of ways, in no case is there still a clear and static division of competencies in the international arena. The range of topics covered over the course of the conference clearly precludes any detailed conclusions being drawn. As with previous events, however, common issues across the sessions can be identified. These issues in turn give an indication of how the participants understand and qualify federalism, what they see as its merits and its limitations. In Brussels, these can to a great extent be summed up under the idea of federalism as a flexible tool. On the one hand, the underlying flexibility of federal institutions can be seen 1) in the accommodation of diversity within the state, and 2) in managing change both from within and beyond the limits of the state. The notion of federalism as a tool, on the other hand, refers to the importance of the underlying political culture, the disposition of key actors, in realizing the potential that federalism offers. This culture of dialogue requires federalism to be understood as a process, rather than a ready-made set of institutions. The Fourth International Conference on Federalism in 2007 will undoubtedly revisit a number of these topics. Each conference, however, will address the questions at a different point in time, as well as in a different national and regional setting. The Fourth Conference, to be held in Asia for the first time, and hosted by the world’s largest federal democracy, will offer a new perspective again. The European Union: A New Federative Experience?